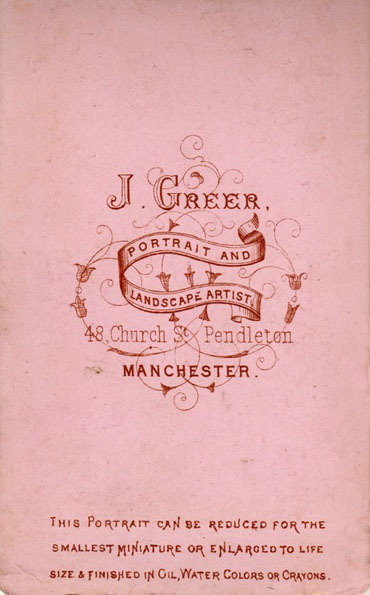 John Greer was born in Manchester about 1833-34, and appears to have died around 1885. In 1886, Greer's wife, Ann (Annie), is running the photography business from 12 Bolton Road, Pendleton. She was still there in 1895. By July of 1898, the address housed another family. The 1871 census shows that John Greer was working as a photographer in Pendleton. Between 1875 and 1879, John was living at 50 Church St., with his studio at 48 Church Street, Pendleton. By the time of the 1881 census, Greer and his family had moved to Seedley Road, and when his daughter, Alice, married on 9 September 1883, their address was 21 Seedley Rd. The carte de visite places the photographic studio at 25 Seedley Rd. By 1900, the family of Thomas Williams, a commercial traveller, was living at 25 Seedley Road. 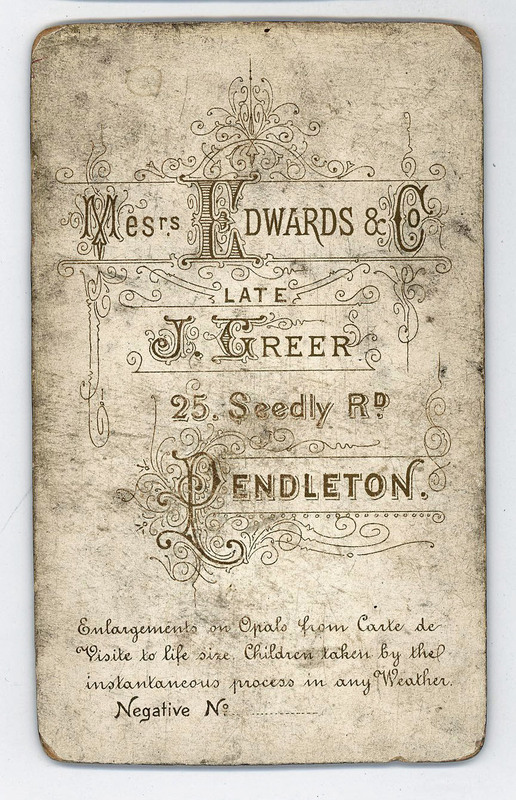 We can conclude that Edwards & Company (or Edwards & Sons), took over the studio after the death of the "Late J. Greer", shortly after 1886, but had either closed or moved to new premises before 1900. 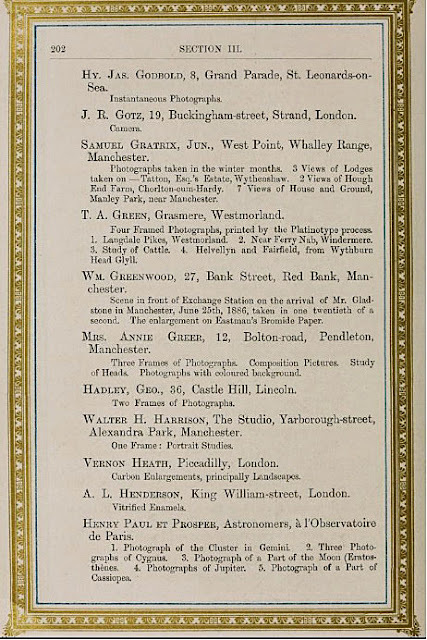 The photographic studio, Edwards & Co., may have been run by Alfred Edwards of 17 New Windsor, Salford, who worked as a photographer there in 1885. An Artist's Sketch Book -- We are favoured by Mr. J. Greer of Pendleton with an example of the utility of photography in the literal reproduction of an artist's sketches. A volume of Scraps from an Artist's Sketch Book, by Mr Selim Rothwell, contains photographic reproductions by Mr Greer of the author's sketches in Rome and elsewhere, often made in positions where photography would have scarcely been available for producing the original scene. The pictures are often fine, the descriptions are graphic and interesting, and photography very good. Greer's albumen prints were tipped in. Presumably Rothwell's portrait used on the frontispiece was taken by Greer. Annie Greer exhibited a selection of her photographs at the Royal Jubilee Exhibition held at Old Trafford, Manchester in 1877.
. Slater's Directory of Manchester & Salford, 1886. [Part 2: Trades, Institutions, Streets, etc.] 181. William Arthur Greer, was married at St Thomas' Church, Pendleton, on 5 Dec 1889. The parish record for this event indicates that John Greer was the groom's father, but he was probably deceased at the time. William is shown living at 12 Bolton Road. John Greer does not appear in the 1891 census, and his wife is shown as head of household. Her occupation is listed as 'photographer'. Slater's Manchester & Salford Directory, 1895. [Part 2: Trades, Institutions, Streets, etc.] 189. Parish records: Baptism of John Greer's son, Albert Ernest, on 6 Sep 1875. Slater's Directory of Manchester & Salford, 1879. [Part 1: Alphabetical Directory] 150. Parish Records. Slater's Directory of Manchester & Salford, 1883. [Part 1: Alphabetical Directory] 151.